The exhibit is displayed in Green-Wood’s 1911 Historic Chapel. An overview of a portion of the display. Some people may not find cemeteries amusing places; but the efforts and imagination of one of Green-Wood Cemetery’s permanent residents brought many hours of fun to countless Coney Island visitors, both the young and the young-at-heart. The Pocono Shooting Gallery: the center target is an artist’s recreation. 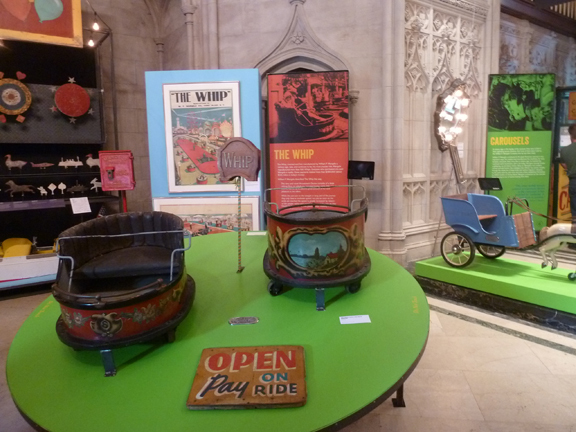 Green-Wood Cemetery, a National Historic Landmark in Brooklyn, has been offering themed exhibits since 1998. “William F. Mangels: Amusing the Masses on Coney Island and Beyond” is the first exhibit that showcases a single person’s work. Jeff Richman, Green-Wood’s historian and an enthusiast of Mr. Mangels’ work, has spent 10 years collecting materials for the exhibit. He reached out to antique dealers and collectors across the country to find items that would help illustrate Mr. Mangel’s gift for creating fun for the masses. The exhibit, on view in Green-Wood’s fabulous 1911 Historic Chapel, is filled with examples of Mr. Mangels’ amusing genius, including a beautifully carved, wooden carousel horse, original sketches and blueprints for some rides, photographs, plus parts and nameplates from Mr. Mangels’ rides and games. It is a hands-on exhibit; you are invited to touch and operate some of the items. Live bullets, albeit short ones, made the dings and dents in the Pocono Shooting Gallery. William F. Mangels was a key figure in the development of the American amusement park in the late 19th and the early 20th centuries. Mangels had trained as a machinist in Germany, where he was born in a seaside town. In 1883, at the age of 16, he immigrated to America, settling at Brooklyn’s Coney Island. Only three years later he had a small Coney Island machine shop; there he made cast-iron targets for shooting galleries. The young amusement-ride enthusiast found himself in the right place at the right time. Coney Island, a.k.a. the People’s Playground, was the heart of the amusement industry. The new rides and games were being created on a regular basis. Each weekend the eager crowds, arriving by train and trolley, put them to the tested. Would these new inventions be fun? Tickle your fancy: ride The Tickler, seen here in a vintage poster. Mr. Mangels was an ambitious and imaginative lad. No longer content to make and repair parts for other people’s games and rides, he began looking into U.S. patent law to cover the mechanisms for rides that he was inventing. In 1901, he patented a version of the overhead gears that controlled the up-and-down galloping motion of the horses. Mr. Mangels’ design became the standard; he became a leader in the field. This mechanism is still in use on most carousels today. 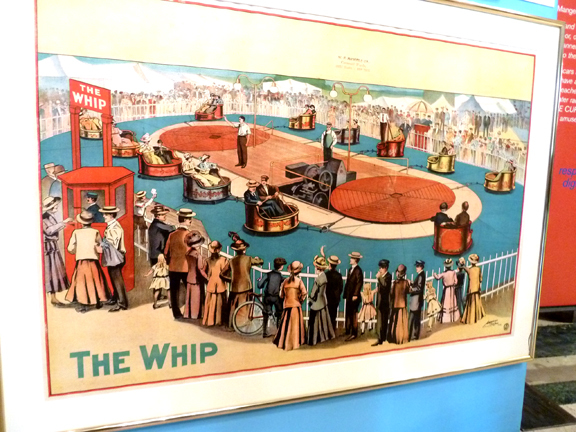 The “Wizard of Eighth Street,” as he came to be known, also invented rides; these included the Whip and the Tickler. When every amusement park had a carousel, it was time to explore other forms of fun. Mr. Mangels designed over 39 different rides and games over the course of his career, including the Tickler in 1906, Rough Riders Roller Coaster in 1907 and the Whip in 1914. What a treat: an invitation to touch! The W.F. Mangels Company of Coney Island could make repairs for any Coney Island ride or game; however, the company specialized in carousels. Mr. Mangels employed or teamed up with the best mechanics and wood carvers; many were immigrants such as him. One notable partnership was with a Russian-born woodcarver, Marcus Illions; combining the artistry of one and the engineering of the other, they produced what are considered the best carousels ever made. One of Mangels’ kiddy rides. The name plate on one of Mangels’ kiddy rides. The Mangels Company also developed some of the first rides for children. Mr. Mangels’ rides are not limited to relics of the past. Take a look at those that are still in use, courtesy of 8 Paws and 2 Tails. Every amusement park needs a strongman. That’s me! Mr. Mangels died in 1958 at the age of 92. The building that once housed his shop on West Eighth Street is now an office of the Department of Motor Vehicles. No amusement to be had there! An elaborate nameplate from a Mangels ride, very Victorian in design. Tags: Brooklyn, Coney Island, Green-Wood Cemetery, Historic Chapel, Pocono Shooting Gallery, The Whip, William F. Mangels, Wizard of Eighth St. The Mangels Fire Engine ride has the number “245”. Down the street from the Mangels factory on West 8th Street in Coney Island, Brooklyn is FDNY Engine 245’s firehouse. Mangels numbered his ride 245 after Engine 245, his neighbor down the block. Thank you for that bit of information, Michael. It helps add to the story of Mr. Mangels. Formidable Strongman Philip! This is good fun!